Ta-Dah! Our Fortieth Anniversary Arriveth! Forty years ago today, two very impractical and disorganized people got married in a little chapel in Vassalboro, Maine. I’m sure many in attendance wondered if the marriage would last four years, never mind forty. I’m referring to Clif and me, of course, and wonder of wonders, the marriage has lasted. Why have we stayed together so long when many marriages fail? If I had the answer to that, I’d write a bestseller and make tons of money. Alas, I don’t have a definitive answer. There are some glimmers, though. Along with being impractical and disorganized—alas, we are still both that way—we are also creative and persistent. At first glance, those two traits might seem like a consolation prize, but in our marriage, at least, they count for a lot. We both value the creative life and the sizzle it brings to all that we do. Clif’s creativity falls more to the visual and graphics, where mine is words and story. It’s a great combination that we have employed many times over these forty years. We both love opening up our home to friends and family, to gather around the table to eat and talk. In our younger days, we had large gatherings, and the little house in the big woods was often filled with people. Now that we are, ahem, more mature, and have slowed down, our gatherings are smaller and much simpler. But as Clif noted today, it’s better to get together here rather than at a restaurant. There are no time pressures, and we can talk as long as we want. In the winter, we enjoy our good-sized dining room, and in the summer our patio. Politically, we are in perfect accord. Again, this might not sound like much, but to us it’s of vital importance. We were left-leaning liberals when we met, and forty years later, we are still that way. We both love movies, books, plays, lectures, and art. Biking. The outdoors. Our children and our friends. Going and out and having a good time. Staying in and having a good time. And maybe those above-mentioned things are enough, that we have such a strong common core that it compensates for being impractical and disorganized. All I know is this: The cherry on the marriage sundae is that after forty years of being together, Clif and I are still good friends. For that, we are oh so grateful. 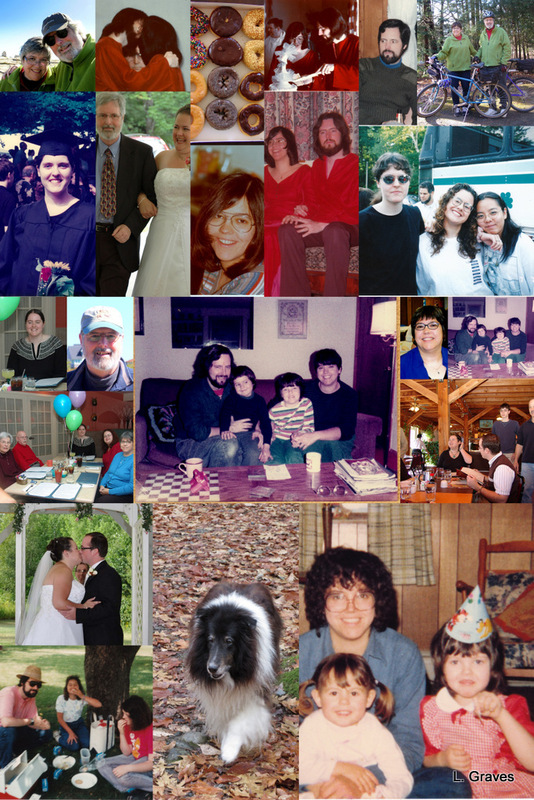 Here’s a collage Clif put together of our forty years of marriage. Previous PostBack on Track with Anniversary Brouhaha: To the Red BarnNext PostHappy First Day of Spring! Happy Anniversary to you both. Loved the collage, but I did have to zoom in a little for these mature eyes to really appreciate the wonderful life story. 🙂 Here’s to many more happy and healthy years for you both. Commonalities become the glue. I think you both have a lot of respect for the other as well. I salute you both – may there be many, many more! Happy anniversary! Love the photo collage! It is funny how we see ourselves versus how others see us. I think you and Clif are two of the most organized people I know. Think of Wolf Moon and the work you both put into that while juggling so many other responsibilities. I rest my case. We are honored to know you and to have witnessed the strength of your marriage as you always deal with adversity with a positive outlook and strength of character. It has been a joy to watch the girls grow over the years and to be recipients of your thoughts and wisdom. Happy Anniversary to a wonderful couple. Aw, thanks so much Beth! Thanks, Helen! Indeed we must. Yay!!! Same to you and yours! Happy happy anniversary!!!! 🙂 Love that photo collage! Have a wonderful day today!! OMG – You guys were hippies. Of course you were – I can’t believe I never thought that. My husband and I were born a bit past that official time, but we are hippies as well. We share so many of the things you listed.Happy anniversary to you both. Indeed we were! And being a hippie is a mindset that crosses generations. Too bad you and your husband don’t live closer. I get we’d get on like a house afire. I was delighted to find another hippie/lover of the arts person among the blogs I read. I think you nailed it when you said that your husband and you are friends. Too many people make the mistake of marrying people with whom they share no common interests and then they find out they don’t particularly respect and like them as people. Hey, wait, I think I’ve done that! Ha! Congratulations on getting it right. Melissa, I think you’re right. However, I do want to add that our personalities are very different. Clif’s a Yankee, and I’m a Franco-American. A mixed marriage if ever there were one 😉 I’ll have to write about that sometime. (A Yankee and a Franco walk into a bar…) But we do have many, many overlapping interests, and for that I am very grateful. Yes, I think the donuts are from DD. Clif and I are both donut hounds—not that we have them very often—so that’s why he included them. Sounds like the perfect-for-you-two balance! Congratulations. Clif’s most powerful statement for me was that you are still in love. Similar politics help my hubby and me, too. 20 years for us. Our youngest is 8. Happy Anniversary! Yes, yes! And happy twentieth to you and your husband. Happy, happy anniversary! We will be having our 40th next year, and I’m thinking we may adopt your celebration approach. I absolutely love the collage. Here’s to many more impractical, disorganized, loving years of laughter together. Aw, thanks so much, Brenda! Looking forward to hearing about your anniversary celebrations. A day late, but many happy returns. The collage is wonderful. So much. So fast!